A Florida psychic's directions assisted searchers in discovering an elderly Houston man's remains in north Harris County, family members and friends say. After Philip Lester, 74, wandered away from a tour of the American Funeral Service Museum on Nov. 30, witnesses reported him everywhere but where his remains were eventually found. Family members and volunteers searched near the museum in vain for Lester, who suffered memory problems and from Parkinson's disease. He had apparently wandered off through a back door of the museum at 415 Barren Springs in north Harris County. 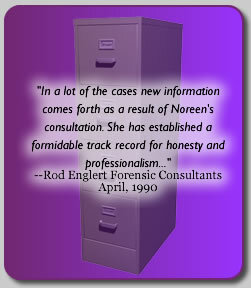 By February, Lester's relatives were ready to try anything and contacted psychic Noreen Renier in Orlando, Fla.
Renier, who has a reputation for helping to locate criminals and missing people, knocked $150 off her $500 fee and asked for maps of the area. "We sent her some maps at first but they were too large and she asked for smaller ones," said Theresa Akins, Lester's daughter. Renier finally received a detailed map of the general area where Lester had disappeared and provided verbal instructions as to where searchers should look for Lester's remains, since it had become painfully clear that he had probably died. Jinese Troup, who had become friends of Lester's family and spent much time searching for him, was told of Renier 's directions by Akins, and on May 17 she went to a drainage ditch along a wooded section of T.C. Jester. Troup's boyfriend located some business cards that were turned over to the Harris County Sheriff's Department. "The Sheriff's Department sent deputies out that day and the day after to search for remains," Troup said, "but we weren't successful." On Sunday at 7 a.m. an expedition under auspices of the Harris County Precinct 4 Constable's Office was launched. Within two hours, Lester's scattered remains were found roughly 30 yards off the 1400 block of Spears Road in heavy brush, about 40 yards from where his business cards had been found and about two miles from the museum. Precinct 4 Chief Deputy Ron Hickman said animals may have scattered Lester's identification and remains, since they will carry away objects bearing a human scent. "I'm really sort of a psychic detective," said Renier. "I spend a lot of my time working with police departments on cases and I've only participated in cases involving missing people about a dozen times." Renier, who once headed public relations and advertising operations for an Orlando hotel, became acquainted with psychic activities when she refused to allow a psychic symposium to use the hotel's facilities. "I was a skeptic and we were a respectable hotel and I had to be convinced that they were legitimate," she said. 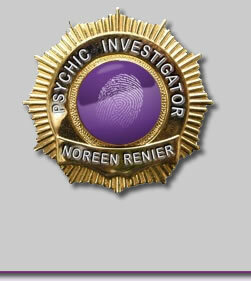 Subsequently, Renier the skeptic became a true believer when she had a series of psychic experiences. By 1980, she was an established psychic. "All I can say is, I finally have my father back with me now," said Akins. "I can't really explain any of this."